Observation - Harbour porpoise in transit - UK and Ireland. Description: Two adult porpoises in a normal slow swim. The forward animal shows the normal roll through the water while breathing, while the rearward shows arching of the tail stock before the dive. 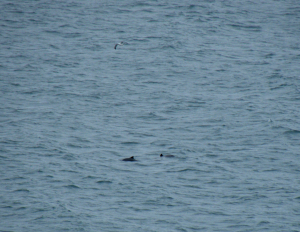 Two adult porpoises in a normal slow swim. The forward animal shows the normal roll through the water while breathing, while the rearward shows arching of the tail stock before the dive.